The history of humankind has always involved hard labour – until the innovations of the industrial revolution everything was done by hand. After mechanisation became widespread life was generally easier for those who made their living through the sweat of their brow and the strength of their back. We take a look at one of the most important inventions which has aided commerce and industry – the forklift truck. The ingenious people of the 18th century were noted for their labour-saving devices. From Jethro Tull’s seed drill (1701) through to Thomas Newcomen’s steam engine (1712) and Richard Arkwright’s spinning frame (1768) and Edmund Cartwright’s power loom (1785), the commercially driven inventors of the 1700s laid the foundation for the Industrial Revolution, which was to change the world. 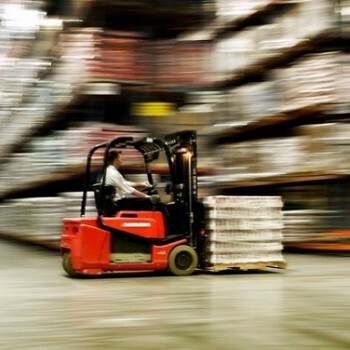 We do not know precisely who invented the forklift truck, but its origins stem from the use of hoists for lifting heavy weights with minimal exertion. In the late 19th century the earliest forklift prototype, a hand-powered wooden platform truck, was developed to cope with the increase in demand and supply that a growing population and diverse trade required. In the early 20th century power was applied to these wooden platform trucks in the form of electric motors which both sped up the transportation process and allowed for more efficient materials handling. However, the big breakthrough for the forklift as we know it today was WWI. The sheer scale of the challenges faced by logistics managers in supplying hundreds of thousands of troops and support staff with all the equipment and food that they needed to fight in Europe was daunting. To cope, they improved the basic platform truck, made it stronger and fitted it with an electrical platform which was capable of being raised and lowered. These first forklifts were only able to lift loads a few inches off the floor but contributed greatly to the war effort and made up for the shortage of manual labour. Naturally, pioneering inventors saw the chance to apply this machine’s capabilities to wider applications and in 1917 a seated counterbalanced truck, known as a Tructractor, was produced by Clark. In 1920, hydraulics were applied to trucks to enable loads to be lifted effortlessly and, soon after, the first electric truck was produced. It had rising forks and an elevated mast, which worked by a ratchet and pinion system, and is considered to be the first proper forklift truck. Although forklifts did not catch on immediately, a development in 1930 saw a massive growth in their popularity and recognition of their potential. The standardised pallet was invented. Wooden pallets allowed a load to be stacked in a uniform manner, increasing vertical storage capacity and revolutionising the manner in which the supply chain works. Developments within the pallet industry also led to stronger, more robust pallets, including heat treated wooden pallets which could effectively carry a heavier load. Since then, materials management has seen innovations which enable goods to be moved around the world with ease. When we consider the origin of some of the materials we use today, we should be grateful to the pioneers of the labour-saving devices which have changed the way we live.